Military personnel stationed in Europe have an opportunity to buy a US specification new car at a substantial price advantage. No local taxes are due when you are located outside of the United States, and, if you are eligible, the military will ship it back to the states without charge. In order to take advantage of this enviable program you must be US Military, a DOD Civilian ID Card holder or a member of a US diplomatic mission stationed outside the USA at the time you place your order. There are a number of dealers over here that do business with the military, and they are located conveniently for many. Many of the dealers sell exclusively to the military. There are also many car dealerships on the economy that offer new US specifications cars as well as cars with European specifications. Used cars, both with European and US specifications are also available through local dealerships. Volvo Cars Military Sales is one of the manufacturers that offer a host of enviable savings and benefits for people staying overseas. Other manufacturers that offer an extremely convenient purchase, supported by professional agents are Jaguar, Land Rover and Lexus. You will find their outlets close to many US military bases in Europe; it is worthwhile checking out their factory direct prices and tailor made offers for US military personnel. Military Auto Source represents some of the best selling automobiles presently being sold in the stateside market. It currently offers Volkswagen, Toyota, Audi, Mercedes-Benz and other brands, offering tax-free vehicles with US specifications at off base locations in Germany, Italy and the UK. Military Auto Source is also the only on-base, factory-authorized distributor set up to sell American made vehicles to military personnel stationed outside the continental United States. Usually located at the PX/BX, it handles Chrysler brands that include Chrysler, Dodge, Jeep and RAM plus Harley-Davidson motorcycles. A BMW Military Sales Program is set up in many military communities to offer not only BMWs but also MINIs with US specifications. There are some dedicated military dealerships. Some of the factory authorized BMW dealers in areas around military installations have a Military Desk to help out. BMW also has a website with details on their Military Sales programs. Cars International of Stuttgart offers a full line of Porsches as well as BMW and MINI. These dealers do everything they can to make sure your purchase is hassle-free. You can expect help in the registration, financing and insurance. Without the dealer's help you would have to arrange for proof of insurance and proof of ownership and handle the registration yourself. All of the dealers mentioned offer cars with US specifications. And these are very important if you intend to ship your car back to the states. Many American states have tough laws. The primary concern is low emissions but there may well also be different standards for bumpers, windshields and even headlights. These dealers do everything they can to make sure your purchase is hassle-free. You can expect help in the registration, financing and insurance. Without the dealer's help you would have to arrange for proof of insurance and proof of ownership and handle the registration yourself. Pre-owned dealerships are becoming more ubiquitous around US military installations in Europe. This is especially true in Germany. As the price of new cars continue to rise, pre-owned cars are becoming a logical and popular alternative for vehicle ownership. Cars have become increasingly better built, more reliable and longer lasting than ever. Consequently, car owners have come to expect many years of use, lots of miles and fewer repair problems from a pre-owned vehicle. Recognizing the lasting value of many of these cars, financial institutions have also increasingly made better financing options available to purchasers. Dedicated military sales new car dealerships may take trade-ins, but they usually re-sell them to pre-owned dealerships. Local economy dealerships with a military new car sales desk may take trade-in and have pre-owned vehicles on their lots, but they often donâ€™t have a salesperson on site to help Americans with a purchase. Dedicated pre-owned dealerships will also take trade-ins or even buy a car outright. They are normally also very experienced in handling the array of paperwork that is a necessary part of getting a pre-owned car. There are issues of VAT, insurance, registration and inspection that need to be sorted out. This is especially true if a customer wants to buy a European specification car that may have been registered in the host country. There are also issues that have to be dealt with in regards to shipping a car home or using a pre-owned dealer to help out in selling your car before a PCS move. The days of the "used car lot" with a small trailer sitting on a fenced-in gravel lot with a dozen or so cars are pretty much gone. Many pre-owned centers are quite nice with professionally appointed showrooms and car lots that are comparable to new car dealerships. Some dealerships may also offer inspection and repair services. 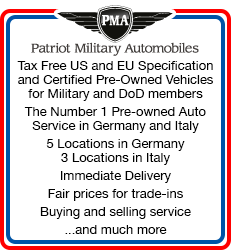 Patriot Military Automobiles, for example, has a major showroom in Kaiserslautern as well as four other locations in Germany and three more in Italy. They offer a wide range of US and European specification vehicles and have staff that has been working with the US military for decades. They also have insurance providers on premise and have a wealth of knowledge in customs, registration and inspection matters. There is a wide variety of financing options. Some dealers have their own factory direct financing programs. There are also the banks and credit unions of the military banking system, and you might want to finance the car through your hometown bank. Depending on the price, loan terms can range from 24 to 60 months. The best interest rates are offered when a 20 percent down payment is made. Dealers can give you good advice on this. And they can help with the insurance. All persons registering a car with the U.S. Forces must have a policy recognized by the host country authorities. For example, German law requires minimum coverage of 7,500,000 Euro for personal injury; 1,000,000 Euro for property damage; and 50,000 Euro for damages other than personal injury or property. You prove that you are insured through the presentation of an Insurance Confirmation Card (ICC). This document will differ depending on the country in which you locate. Only insurance companies that can provide proof of insurance documents required by the national authorities can sell the insurance that enables the registration of a car by the military in Europe. Companies providing such service include GEICO, which you can reach toll free in Germany at 0800-100-8687. From other European countries call 0049-631-41463100. The United Services Automobile Association (USAA) provides competitively priced auto, property and life insurance, as well as banking, investment and financial planning services. You can call them from land lines in Europe at 00-800-531-81110, or visit their website at www.usaa.com. Mirascon Insurance Solution, headquartered in Cologne, offers car and motorcycle insurance to NATO military personnel and members. They have five locations in Germany. Call them at 0800 - MIRASCON. On the web at www.mirascon.com. There is a great variation in the premiums paid for insurance. Beginning drivers pay more than experienced drivers; those driving big, powerful cars pay more than those with more modest vehicles; those living in urban areas pay more than those in rural areas, and those who have been found liable in accidents pay more than those who haven't. There is no requirement for a driver to have any but third party liability insurance, but others kinds are available and sometimes advisable. There is full comprehensive, covering all damages or injuries done to your own car, another car or a person or object. There is also partial coverage for fire, theft and other sorts of damage (from break-ins, shattered glass, animals, etc. ), and coverages for the death or disability of a passenger. Such policies often have deductibles, meaning you must swallow the cost up to a certain upper limit. These make the insurance less costly. Many of the dealers (but not the on-base Exchange New Car Service) take trade-ins and handle used cars. These can be a good value if you shop carefully. The dealers normally offer some sort of limited guarantee. Some banks, and even some dealers, may finance used cars, but this is not as easy as with new cars. Factors such as mileage, age and value are involved. Military personnel stationed or deployed outside CONUS can take advantage of a number of special programs to buy a new car. Navy personnel stationed or deployed outside the USA have an opportunity to buy new US specification cars at a substantial price advantage. In most cases no local taxes are due, and, if you are eligible, the military will ship it back to the states without charge. There are also programs that allow a buyer to purchase a car and have it waiting for them in the USA after their deployment. There are a number of dealers that do business with the military, and they are located conveniently for many. There are a wide variety of financing options. Some dealers have their own factory direct financing programs. There are also the banks and credit unions of the military banking system, and you might want to finance the car through your hometown bank. If you are deployed or underway on a ship in international waters, or on PCS orders at an overseas installation, you can take advantage of a military-only new-car-buying program from Navy AutoSource, the official Ships Stores new car program, and its affiliate, Exchange New Car Sales selling through Navy Exchanges overseas. Makes offered are Chrysler, Ford, Harley-Davidson and Buell. Volvo Cars Military Sales has sales agents serving the military at or near Bahrain, Guam, Okinawa, Yokosuka, Rota, Naples, Souda Bay and Incirlik, Turkey. 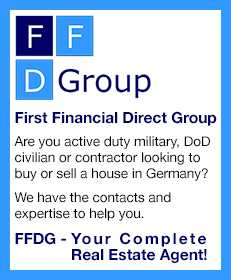 All Military Agents can help make insurance a trouble free experience. Persons registering a car with the U.S. Forces must have a liability policy recognized by the host country authorities. You prove that you are insured through the presentation of an Insurance Confirmation Card (ICC), which will differ depending on the country in which you locate. Only insurance companies that can provide proof of insurance documents required by the national authorities can sell the insurance that enables the registration of a car by the military overseas. Others kinds of insurance are also available and sometimes advisable. There is full comprehensive, covering all damages or injuries done to your own car, another car or a person or object. There is also partial coverage for fire, theft and other sorts of damage (from break-ins, shattered glass, animals, etc. ), and coverage for the death or disability of a passenger. Such policies often have deductibles, meaning you must swallow the cost up to a certain upper limit. These make the insurance less costly. If you intend to ship your car back to the states it is important that you get one with American specifications. Some states have tough laws. The primary concern is low emissions but there may well also be different standards for bumpers, windshields and even headlights. Some dealers take trade ins and handle used cars. These can be a good value if you shop carefully.